The Genesis Drip Irrigation System was created for gardeners and growers who are looking to conserve water consumption by delivering the right amount of water directly to the root system of the plants. Each of the Genesis Drip Irrigation Systems are designed for specific projects to make it easier to select the system that is right for you. Genesis also offers additional accessories to allow for the grower to customize their own system to fit their own personal needs. 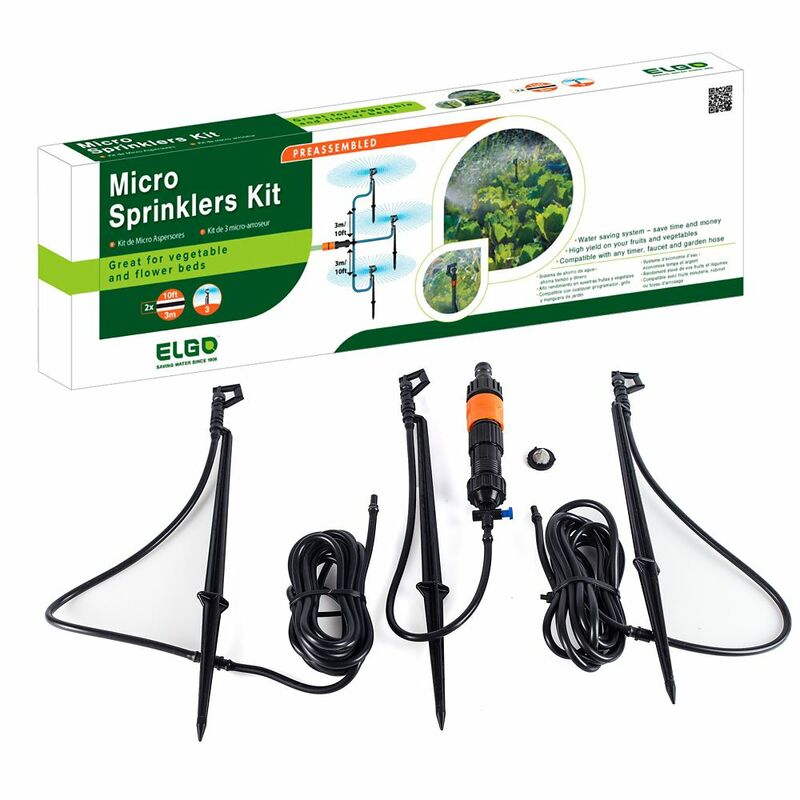 This kit is designed for overspray watering through the use of 3 micro sprayer heads. The design allows up to 540 sq. ft. of watering coverage with a 360 degree watering pattern. Each of the Genesis Drip Irrigation Systems are designed for specific projects to make it easier to select the system that is right for you. Genesis also offers additional accessories to allow for the grower to customize their own system to fit their own personal needs. This kit is A PORTABLE SPRINKLER WATERING SYSTEM, designed for customers who have an area that needs watering but do not want a permanent system in place. Ideal for watering grass or crops that are planted in a rows. All that is needed is an existing garden hose that will need to be cut to allow for the quick connectors to be placed in line. The slim-line design allows for easy hose reel retrieval without bunching. Will work with up to 1,000ft of hose with 60 psi max. The ideal use is when your crop is planted up to 16 ft wide (3- 4 rows wide). By placing the micro sprinklers in the middle of all the rows will ensure that all crop will be watered. Flexogen<sup></sup> Pro gets the dirty jobs done right every time. With patented construction and professional-grade materials, Flexogen Pro stands up to unpredictable construction sites, nonstop landscaping jobs and other intense commercial uses without bursting or splitting. 20 ft. Micro Sprinkler Watering System The Genesis Drip Irrigation System was created for gardeners and growers who are looking to conserve water consumption by delivering the right amount of water directly to the root system of the plants. Each of the Genesis Drip Irrigation Systems are designed for specific projects to make it easier to select the system that is right for you. Genesis also offers additional accessories to allow for the grower to customize their own system to fit their own personal needs. This kit is designed for overspray watering through the use of 3 micro sprayer heads. The design allows up to 540 sq. ft. of watering coverage with a 360 degree watering pattern. 20 ft. Micro Sprinkler Watering System is rated 4.3 out of 5 by 4. Rated 5 out of 5 by KD38 from Perfect for the small flower bed at my townhome. Use... Perfect for the small flower bed at my townhome. Use the 180 degree option to confine it to only my yard and avoid spraying the sidewalk. Rated 3 out of 5 by Al from Didn't come with any instructions. ... Didn't come with any instructions. Rated 5 out of 5 by Mothermyers58 from Love this product! It is the perfect fit for my flowers and bushes that border my backyard patio.... Love this product! It is the perfect fit for my flowers and bushes that border my backyard patio. It sprays just the right amount of water, and is easy to adjust direction! Rated 4 out of 5 by Lazymama from Good purchase Good value for the money. Easy to install. Don't have to worry about watering the flower bed. This takes care of it for me.